Hi all! Hope you’re having a great start to your week! Before we get to an awesome giveaway, let’s start with a picture from Instagram of the #PowerbowlADay Challenge! 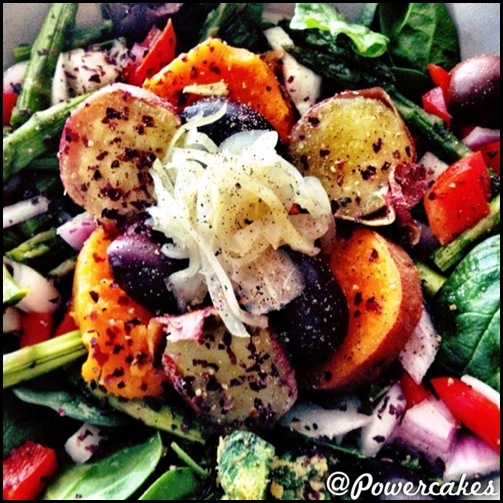 Japanese sweet potatoes, raw sauerkraut, topped with dulse flakes & green goddess sauce. I can’t believe the challenge is almost over & April is almost here! Winners will be announced at the end of the month. 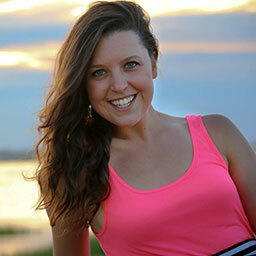 Speaking of winners – today I am so excited to host a new giveaway from my friends from VEGA! I am a fan of VEGA & have found their Thrive Forward movement to be so educating. It’s really taught me more about plant based eating & I happen to adore all of the VEGA products. Their protein powder is a consistent ingredient into my Creamy Vanilla Nutmeg ChiaOATS or POWERSMOOTHIES topped with bananas & granola. 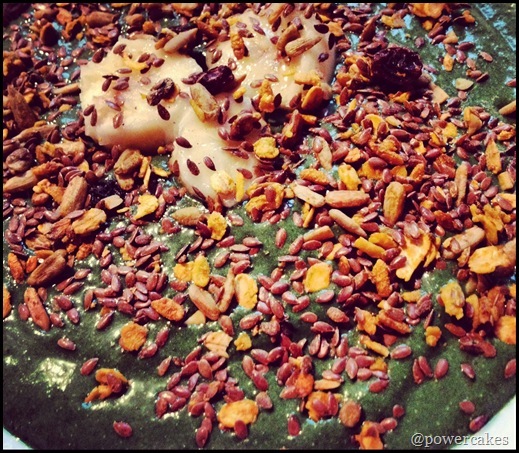 Have you ever wished that you could have all of the nutrients of a smoothie in an on-the-go bar? Well, thanks to VEGA Founder Brendan Brazier, you can! Brendan is a plant based hero & has formulated a Vega One Nutrition Bar. Free from gluten & contains no artificial flavors, colors, or sweeteners. The bars are made from natural, whole food ingredients. 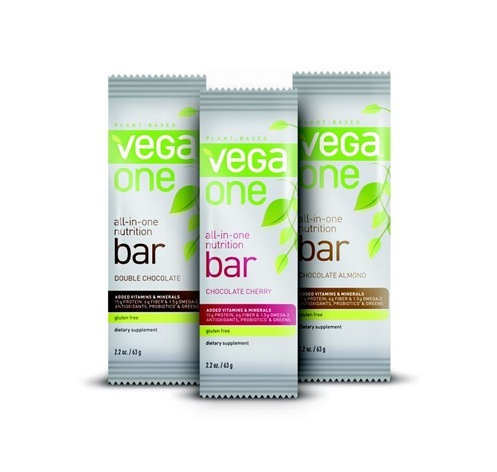 The Vega One Nutrition Bar is a convenient, all-in-one supplement, packed vitamins and minerals. The bars contain 15g protein, 6g fiber, 1.5g Omega-3, plus antioxidants, probiotics and greens. These bars are available in 3 yummy flavors! Leave a comment below stating what flavor bar you would like to try. Winner’s will be announced this Saturday, March 30th! GOOD LUCK!! I would love to try the chocolate almond! They all sound delicious! I would like to try the double chocolate protein bar! I already love their chocolate protein powder! what a generous giveaway!!! I would love to try the chocolate cherry! My number one pick to try would be the Double Chocolate VegaOne bar. I think this would be a great option for me as a healthy snack that keeps me fueled. Especally since I start Nursing school in one month I need a snack that gives me everything my body needs to stay fueled, energized, and healthy. I would love to try the Chocolate Almond!! Thank you! I’d love to try cherry chocolate! But really, don’t they all sound yummy?! I would love to try the Chocolate Almond! Woot! I would love to try the double chocolate!! Mmmm… since it’s much better than single chocolate I’d like the double chocolate please. I would love the chocolate cheery bar!! Oh man, they all have chocolate so it’s hard to choose! 😉 I think I’d have to go with the Chocolate Almond. The people at Vega are amazing! All of their products are the bomb.com and I love their approach to plant-based food on the go! Count me in for anything with chocolate and almond! What a great treat! I would like to try the chocolate almond. chocolate almond sounds tasty! and with nutrition stats like that, healthy to boot! I’d love to try the chocolate cherry! yummy! I would love to try the chocolate almond. I love love love Vega products too. 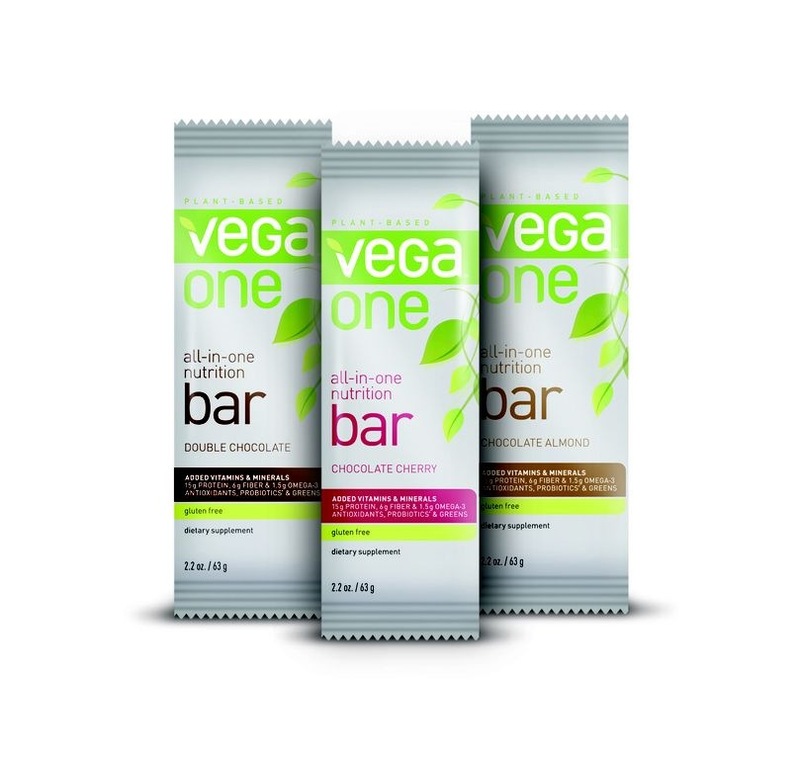 I would love to try the Double Chocolate Vega One bar! the chocolate cherry sounds fun!!! I’m definitely a chocolate girl 😉 double chocolate would be right up my alley! Thank you for the giveaway! Mmmm! Chocolate cherry sounds so delish! Like heaven in a bar! Choc almond sounds so good! Yummu, chocolate almond sounds amazing!! I am a chocolate lover through and through. Since I am allergic to almonds, I would def choose the double chocolate! These muscles call for Double Chocolate pleeeeeeease you rock! I would absolutely LOVE to try the Double Chocolate flavor! I love everything about Vega! Would love to try chocolate almond! Omg! Chocolate Almond sounds amazing!! And 15g of protein? Crazy!! I’d love to try chocolate almond but assuming I’m probably not eligible to enter since I’m in Australia. I’d like to try the double chocolate! I would love to try the chocolate almond ones … my favorite combination! I would love to try double chocolate! Thanks for the great giveaway opportunity! Chocolate almond, Please! Thanks for introducing me to Vega, Kasey!! I love this product so much that I applied to be one of their sponsored athletes for my triathlons! I had one of their bars this morning during my 3 hour trainer ride and it was perfect and delicious. Buying all the nutrition I need for ironman training can get really, REALLY expensive,so winning one of these boxes would be a great help! Ahh I would live to try them all! Double chocolate is my vote for now!Thanks for the giveaway. I would have to say as much as I lurve chocolate! I love chocolate and almonds together even more!! They all sound delicious!! I would love to try chocolate cherry. Chocolate almond would be my first choice, but honestly, CHOCOLATE anything is good! Would love to try the chocolate cherry since those are my favorite smoothie flavors! I would love to win the chocolate cherry!! Chocolate almond sounds wonderful! Thank you! I would ABSOLUTELY LOVE to try the chocolate almond.They sound so delicious and finally appear to be something that I can have! I have been following Vega a lot recently (especially since I discovered that you use some of their products Kasey!). Because of all my allergies Vega appears to be the perfect fit for me! I love all things chocolate and just recently gave up all things chocolate for Lent. So as of Sunday marking my 40 days choco free, I’d have to say double chocolate for the win!!! I’d love to try the chocolate almond! I would like to try the double chocolate bar! These all sound super delish, but I’d love to try the chocolate almond! I’d love to try the double chocolate!! I would like to try the chocolate almond! Yum! I would love to try the Chocolate Almond as well! With traveling so much for work, I would love to have the DOUBLE CHOCOLATE bars to travel with. Finding vegan food on the road is challenging. Believe it or not, I’m recovering from food poisoning as we speak from my trip two days ago and airport food! Safe travels, safe food choices. Count me in for DOUBLE CHOCOLATE Vega bars! They all sounds more than delicious, but I’d have to go with double chocolate! Can you really blame a girl?! Thanks for such a great giveaway. SO hard to pick, but I think I’d go with the double chocolate. Sounds so amazing right now! Ooo these sound amazing! I want to try the Chocolate Almond! I tweeted the giveaway! Thanks! Double Chocolate! I recently went gluten free and these would be a lovely addition to my cupboard. how do you choose between all that chocolate goodness? i actually think the chocolate cherry looks the best! although really, you can’t go wrong with chocolate anything!! 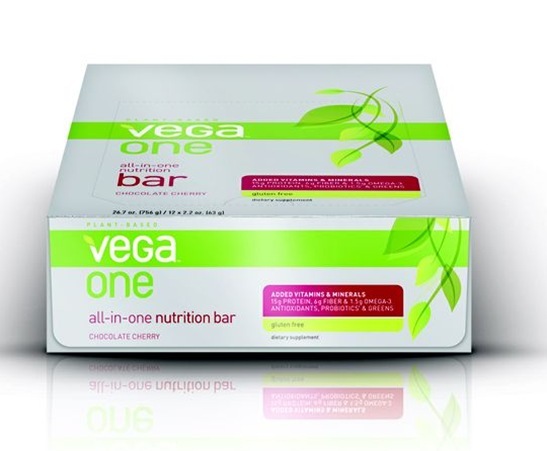 i’ve heard great things about Vega products, but have yet to try them, I would love to try anything from them! It would have to be choc almond. I am studying and love nothing more than to fuel my mind and body with the best nutrition possible. The riboflavin and L-carnitine in the almonds are great at boosting brain function and magnesium in chocolate helps to keep relaxed during a stressful study sesh (a great excuse to eat chocolate!). Good luck to everyone and happy, healthy eating!! All the flavors sound like a sure bt to be delicious, but I’d love to try double chocolate, maybe even chocolate cherry! I need as many healthy food items as possible to help me gain weight back! So honestly, surprise me. (: Any healthy snack is perfect to me. I definitely will be tweeting this. Dark chocolate covered almonds are one of my fav snacks, so definitely Chocolate Almond. Yum! Since I’m doing the Whole 30 right now, nothing sounds more delicious than a Double Chocolate Vega bar!! I would love to try Chocolate Almond! anything chocolate of course is going to be delish, but the cherry sounds bomb! I would looooooove to try the Double Chocolate!! Hard to pick just one! Buy chocolate cherry sounds yummy! Chocolate cherry for the win! Would love to try them all, since I am the biggest lover of chocolate! But if I HAD to choose… chocolate cherry! I would LOVEEEEE to try the chocolate almond because that combination is probably my FAVORITE!!! Have you tried the chocolate almond spread from trader joes?? ?…probably something like that! Mmm, I would like to try double chocolate for sure! Chocolate cherry!!!! I love Vega One. I have had their shakes, but haven’t tried their bars yet. They all sound good! If I had to pick one, I would pick the Chocolate Cherry. Chocolate-covered cherries & Black Forest Cake have always been my favorites — so I would love to try the Chocolate Cherry! If I win this giveaway–Double Chocolate please! I am easy, I would love to try any flavor that has chocolate! Guess that means they all sound yummy! I would love to try the chocolate almond! I just tweeted your awesome contest! Thanks! would love to try the chocolate almond! Oh, fantastic! I’m most excited about the chocolate cherry. i would love to try the double chocolate flavor. yum! They all sound delish! I will go with Chocolate Cherry. tweeted too! Thanks for the giveaway! Double Chocolate please! Nom Nom! Chocolate cherry please. I’ve never tried any of them but I think that bar would be my first choice. Tough decision, but I think I would go with the chocolate almond. They all sound good! Love Vega products!! I would love to try the chocolate almond flavor. Oh my! They all sound so delicious! Since I would normally go for the double chocolate, I am going to go with something different and say I would like to try the Chocolate Cherry!!! Yum! These look great, I love anything with chocolate, thanks for offering the contest! I would LOVE to try the chocolate almond bar! Two of my favorite things combined into one? Sweet! I’m always looking for good bars but so many have such fake ingredients. These look amazing! I would love to have the opportunity to try them! The double chocolate bars would definitely hit the spot! yumm thanks for this giveaway! The Double Chocolate flavor sounds amazing! 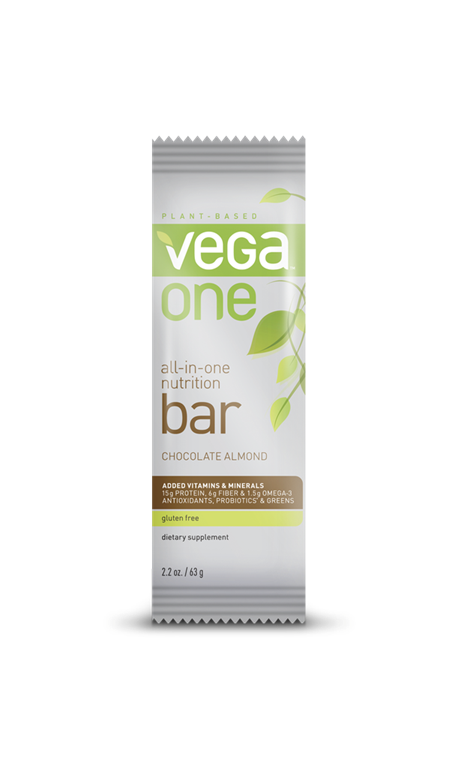 I’ve never tried any Vega products, and I’m always looking to try new bars, especially ones that are made with natural ingredients. I would love to win this giveaway! I would love the chocolate cherry. Thank you. I would love to try the chocolate almond! Yum! Chocolate Almond! Two of my favorite things! I would LOVE to get my hands on a box of the Chocolate Almond! I love Vega’s chocolate protein powder post-workout, so I know that I would love to have these bars as an addition to my on-the-go lifestyle! Yummmm I want to try chocolate almond! These look so yummy! I would definitely want the double chocolate kind! Being a choco-holic it is a clear choice 😉 I can’t believe how much nutrition is packed in these little bars! I would LOVE to win!!! I love chocolate, plant based foods, and most of all being healthy!! Would LOVE to try the chocolate almond bar! Always looking for ways to incorporate more plant based foods into my diet and ALWAYS looking for healthy snacks I can take with me!! Tough choice! Chocolate cherry sounds awesome though! These look awesome! I would LOVE to try the chocolate almond bar! I would LOVE to try the double chocolate… or chocolate almond… I can’t decide! They all sound fantastic, but double chocolate would be my pick! Ty! Would love to try the chocolate almond! Your blog is amazing! The double chocolate or the chocolate almond both sound delicious Thanks so much! I would LOVE chocolate almond!! If they taste anything like a chocolate almond larabar then they are my favorite already!! I’d love to try it! Thanks for having this giveaway! I would love chocolate almond!!! Can’t wait to try someday! I would love the double chocolate one!! I love Vega products! The chocolate cherry one sounds super yummy! Oh my gosh… Double chocolate sounds heavenly, but I would actually LOVe to try chocolate cherry! Cherries are supposed to be beneficial for muscle recovery and I definitely need all the help I can get!! I would love to try the Chocolate Cherry! Thanks for the giveaway! I would Love to try the double chocolate! Chocolate almond or double chocolate?!?! Oh the choices…but double chocolate is always a good choice! I’d love to try these please!! Chocolate Cherry sounds SOoOOo good! Chocolate cherry!! Yum yum choc and fruit is the best combo! They all sound great, but especially the chocolate cherry flavor! They all sound great but I especially want to try the chocolate almond! That Chocolate Cherry sounds fantastic! I’d love to try it! I’m 6 weeks out from my first competition and double chocolate is making me drool. Would LOVE to wain one!! I use Vega protein powder and have all the way through my prep – I have a very sensitive stomach and it’s the only powder I’ve found that doesn’t upset my belly, would be honoured to try these bars! Chocolate Almond would be fantastic! Chocolate Cherry would be awesome! There is no question, I most NEED to try Chocolate Almond. There is no better combination in my mind than nuts and chocolate!! Mmm I would love to try the chocolate almond!! Mmmm all of the above! But I’m a sucker for double chocolate anything! Thanks!! I would love the double chocolate!!! Thank you so much!